This month is the 70th Anniversary of the Allied Forces dropping two atomic bombs on Japan to end World War 2. I have had a draft of this article on my computer for most of the month, but I’ve been unable to complete it. As a campus minister, August is the busiest month of the year. So I’ve been unable to find the time to finish the draft. I apologize that I’m posting this article two weeks after the anniversary of the dropping of the bombs; I’ve missed all the discussion about the bombs. And, to my regular readers, I apologize that I haven’t posted any articles in the month of August. I won’t bury the lead in this article: it’s surprising more Christians don’t question and reflect on the morality of dropping the atomic bombs on Japan to end World War 2. On August 6th and August 9th, 1945, the Allied Forces dropped two atomic bombs on the Japanese cities of Hiroshima and Nagasaki. More than 129,000 people were killed in the bombings, and most of these casualties were civilian casualties. According to Wikipedia, half of the casualties occurred in the weeks and months after the bomb; the people died because of injuries, burn, radiation poisoning, and the like. When I was a kid, I was deeply interested in World War 2. It probably arose from watching old war movies and History Channel documentaries with my father and grandfather. I remember reading and rereading an encyclopedia article on the atomic bombings of Japan. I was fascinated with that decision and thrilled at the power the U.S. military displayed in the bombings. 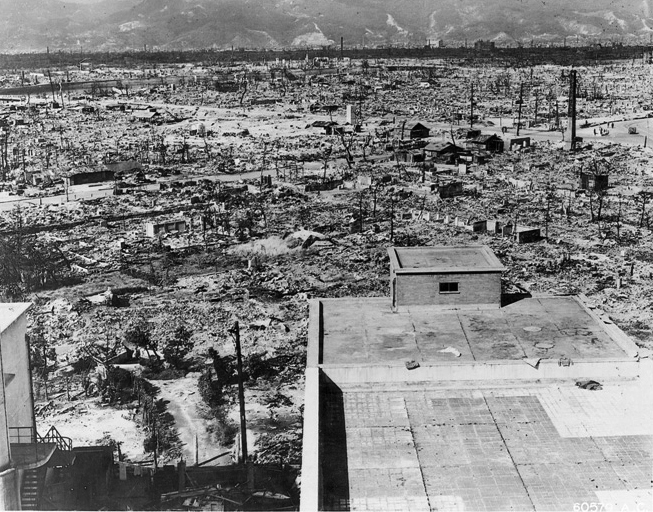 At the time, I would not have understood anyone questioning the use of the atomic bombs in Hiroshima and Nagasaki. Even more, I could not understand why the U.S. didn’t use its nuclear weapons more frequently. We could have won the Korean War with one or two nuclear bombs. (Didn’t General MacArthur urge the President to authorize that?) Though it’s not obvious that a nuclear bomb would have ended the Vietnam War, why not give it a try? These weren’t just the thoughts of a ten-year-old boy who enjoyed reading military history. I had these thoughts in high school. You can write that off as naivete. There’s some truth to that. I couldn’t comprehend the level of suffering that such bombs caused. It was just numbers on the page. Can anyone who doesn’t have first-hand experience the bombings or the aftermath comprehend such suffering? I don’t think it was a youthful naivete, because I have heard many people express such thought about the atomic bombs. In fact, I know very few people who would even question the use of them. And I’ve heard many people call for a greater use of atomic bombs. After 9/11, I remember people saying that they wanted the U.S. to drop a few atomic bombs on Iraq and Afghanistan. Some people said that we should just wipe out those countries. I’m older now and less wedded to a particular political group, and I’m not as interested in defending every action of the U.S. Government. So I’m willing to question things I used to avoid questioning. Shouldn’t Christians be slower to celebrate an act that killed so many civilians? Shouldn’t Christians, of all Americans, be the most reflective about the ethics and morality of such an act? I hope you’ll notice the modest aims of this post. I’m not arguing that the bombing were evil and against Christian values. I’m simply arguing that Christians in our country should be slow to celebrate the bombings of Nagasaki and Hiroshima, and Christians in our country should be the most reluctant to suggest the future use of atomic weapons. These are bombs that incinerated thousands of women and children. The suffering caused by the bombs was horrendous. Those who weren’t killed were severely burnt. It was a living hell for the populations. The New Testament’s teachings on the use of violence may not be pacifistic, but it’s not so obvious that Jesus didn’t teach pacifism. (I’m not a pacifist by the way.) What does “turn the other cheek” mean for the Christian citizens of a nation at war? What is a Christian’s duty toward civilians of a less-than-democratic state? (The women and children of Japan had little-to-no political influence over Japan’s decision to wage war.) Does Romans 13 mean that can support a nation’s use of force as long as it is used justly? If so, what does the “just” use of force look like? Christians have the highest grounds for valuing human life, so we should always be slow to advocate that a human life be taken. (In this case, we should be slow to celebrate that a life has been taken.) Again, notice that I’m not saying a human life should never be taken. But if all humans are made in the image of God, then we should be annoyingly reflective about situations in which human lives are being taken. It should never be assumed or simply a given that it is okay to kill another human being. As I said, I’m not trying to advocate a particular position on these. But the anniversary of these bombings led to reflect on how little Christians reflect on the appropriateness of such actions as the bombings. Let me close with this: I am driven by the conviction that Christians should be the most reflective and thoughtful people in the world. Not because we are ivory-tower intellectuals or nerds. But because, of all people in the world, we have the most reason to think that our actions have eternal significance, that human lives matter, and that ideas change the world. Two millennia ago, the world was turned upside down by the idea of God had come in the flesh, suffered and died, and rose from the dead to save the world. We should be convinced that ideas change the world, that our actions matter, and that all our thoughts and actions should be smothered in thoughts about the teachings and values of Jesus. We should be the most reflective people in the world, even about issues that everybody around us accept and celebrate without a moment’s reflection.